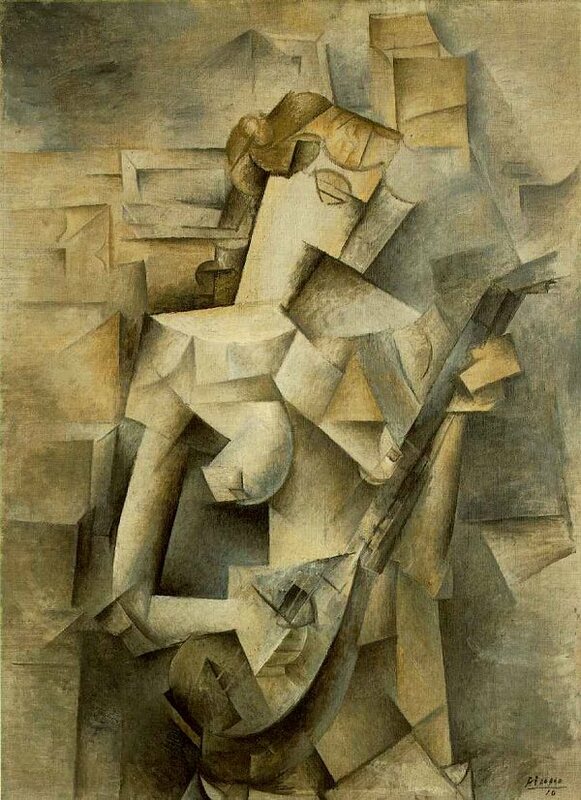 Girl with a Mandolin (Fanny Tellier) is not only one of the most beautiful, lyrical and accessible of all Cubist paintings, but is also a valuable document of the period. For the fact that at the time Picasso saw the work as unfinished, allows us an insight into his aesthetic intentions and his technical procedure. In the first place, the legibility of this canvas demonstrates conclusively that although Cubist paintings were becoming more abstract in appearance, the artists were still deeply conditioned, at least in the early stages of their works, by the material existence and the physical appearance of their subjects. Then again the painting illustrates in a very concrete fashion the pull Picasso felt between the desire to give forms an explicit, volumetrical treatment, and the need to flatten them up onto the picture plane (compare, for example, the almost sculptural treatment of the breasts and the arms with that of the head, which is rendered in terms of two flat planes). Had the painting reached completion, it would have become simultaneously more elaborate, more abstract and more consistent in style..."
From John Golding, "Cubism, A History and an Analysis, 1907-1914"